Krishna is one of the most popular deities in Hinduism; the eighth avatar, or incarnation of Vishnu. As a young boy Krishna is the foster child of cowherds and shows his divine nature by conquering demons. As a youth he is the lover of the gopis (milkmaids), playing his flute and dancing with them by moonlight. 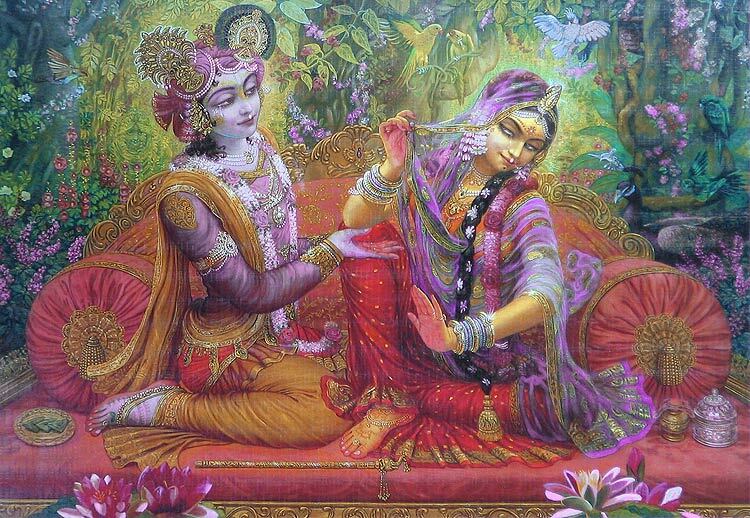 It is there, among the gopis, that Krishna meets and falls in love with Radha. A timeless beauty, Radha is Krishna's eternal consort. Their love is playful, passionate, and devoted. 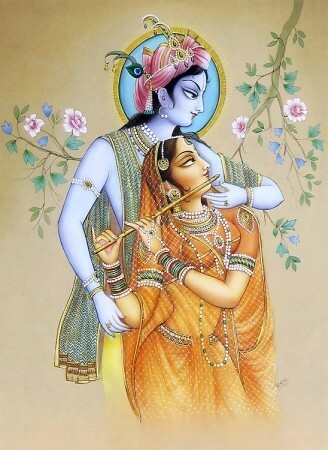 Like the moon and moonlight and flowers and fragrance, Radha and Krishna are one. They are one soul in two bodies. The play of Krishna and the gopis is regarded in Hinduism as an image of the soul's relationship with God. The divine love of Krishna and his beloved gopi Radha, has been celebrated in Indian religion and culture for centuries. Radha embodies the totality of love for Krishna. She personifies 'Bhakti' for the Lord. Indeed, she herself is the loving devotion to God. She awakes us to the love of Krishna. The love of Radha and Krishna is known by all Indians, and indeed is one of the greatest love stories of all times. Radha's love for Lord Krishna is interpreted as the quest for the union with the divine. According to Vaishnavas (followers of Lord Vishnu), the kind of love like that of Radha is the highest form of devotion, where the human soul wants to unite with the ultimate Supreme or Almighty. The ecstatic love relation between Radha and Krishna was like beloved and lover or husband and wife. the Krishna and Radha Tile Swap Puzzle in our Tile Swap Puzzle section.